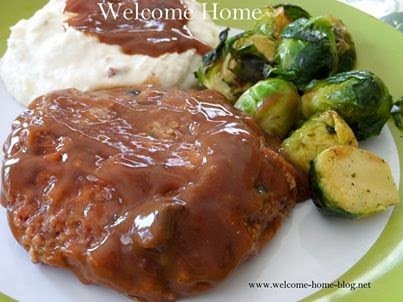 My Mom use to call these Hamburger steaks but most people call them Salisbury steaks. All cooks have their specialty dish...a signature dish so to speak.... that we know will always get rave reviews from friends and family. This is good old fashioned comfort food my friends. Tender meat patties full of robust flavor served with mashed potatoes and green beans or corn. Now of course she made her own beef gravy but I found one that tastes identical and I use it to get the same wonderful recipe. You will love this recipe. Mix all ingredients together in a large bowl along with a half cup of the beef gravy from one jar. Add more breadcrumbs as needed for the right consistency. Shape into oblong or thick round patties and set aside. In large skillet, melt olive oil and then add butter. Brown patties over medium heat. Once browned, remove from skillet and drain off excess fat but do not wash or clean skillet. Add remaining beef gravy to the skillet making sure to blend the pieces of beef and onion and garlic left on the bottom. Add patties back in the skillet and cover simmering on low heat for about 40 minutes. Serve with gravy over rice, mashed potatoes or buttered noodles. Absolutely divine! Melt butter in your same skillet that you browned the patties in. Stir bottom to gather the bits from the bottom of the skillet. Then whisk in the flour. Continue to whisk the flour for about 1-2 minutes until the flour is cooked. Slowly add the beef broth and whisk often for about 8-10 minutes. Whisking is the key to lump less gravy. Next whish in the cream which will thicken it slightly and cook for another 2 minutes. Finally, add a tablespoon of butter and whisk in well. This will give your gravy that beautiful gloss. Add this instead of store bought gravy to your dish. This is making my mouth water! Can't wait to try it!